Hershey, Pa – USA Theatres, promoters of the upcoming American Antique Toy & Coin-Op Show, recently revealed some of the quality dealers who will be exhibiting at the inaugural show. Tom Miano, owner of Serious Toyz, will be occupying 24 feet of exhibit space, offering a fine variety of vintage toys and collectibles; while Fred Franklin, owner of Rec Room Specialties, will be showing off a great selection of antique slot machines, game machines and other coin-operated related items. The American Antique Toy & Coin-Op Show will feature quality exhibitors buying, selling and trading an array of antique and collectible toys, such as character toys, tin toys, mechanical toys, banks, advertising items and coin-ops, according to the promoters. The show is set to debut on Saturday, March 3 at the Eastern Civic Center, located at 90 Harding Road in Old Greenwich, Connecticut. “The location at the Greenwich Civic Center is a highly strategic choice,” said Ronald M. Vastola, Outreach Coordinator of USA Theatres. The site is conveniently located to most major metropolitan areas in the Northeast, and can easily attract collectors from Maryland, Washington DC, Pennsylvania, New Jersey, New York, and of course, the New England states. Other exhibitors on tap include Mike Milo and Lauren Czajkowski, co-owners of Milo Toys & Collectables; and Ken Laurence, owner of Heroes Unlimited and show promoter of the Super Megashow held in New Jersey and the Boston Super Megafest. Additional exhibitors from New York, New Jersey and Pennsylvania, who specialize in jukeboxes, soda machines and gumball machines, have responded to the show; including Dan Morphy, owner of Morphy Auctions, who is interested in utilizing 24 feet of exhibit space. Anyone planning on attending the show can expect to pay $10 for general admission on Saturday from 9:00 a.m. to 3:00 p.m. For the serious collector, early buyers are welcome Friday evening at 6:00 p.m. and also Saturday morning at 7:00 a.m. for $20 per person each day. Children under 12 will be admitted for free, accompanied by a paying adult. A variety of food and beverages will be available for purchase, provided by Joemomma Foods, Incorporated of Hershey, Pennsylvania. Exhibitor space is still currently available; however, exhibitors are encouraged to sign-up soon as spaces are limited. “It’s going to be a brisk and fantastic show,” Vastola added. For hotel accommodations, you may contact the Hilton Stamford Hotel & Executive Meeting Center, the official hotel of the American Antique Toy & Coin-Op Show. The Hilton is located at 1 First Stamford Place in Stamford, Connecticut, just 1.4 miles, 4 minutes from the Eastern Civic Center. Mention the show to receive a special room rate of just $79 per night (promo code: AMA). 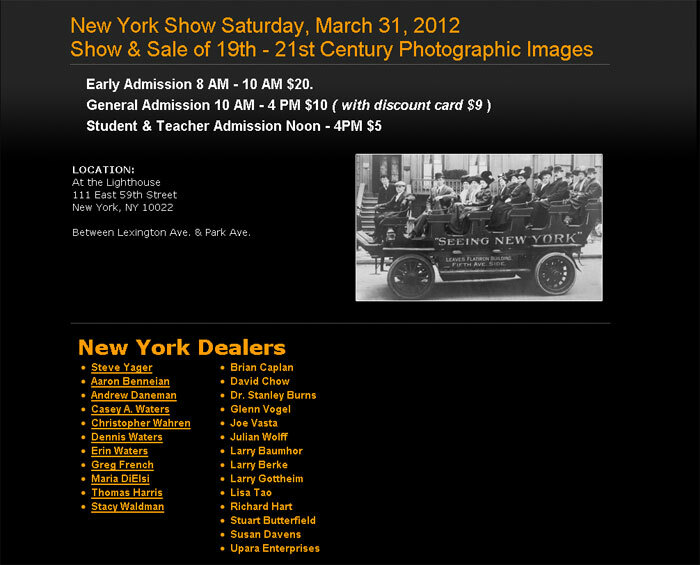 Antique, Modern, Digital, and Vintage Photography the most diverse show of photographs. HERSHEY, Pa – USA Theatres, which operates drive-in and outdoor theatres in Central Pennsylvania, is entering into the world of antique toys by launching the American Antique Toy & Coin-Op Show. According to the company, the show will feature quality exhibitors buying, selling and trading a wide array of antique and collectible toys, including tin, cast iron, mechanical, pressed steel, banks, advertising, holiday, Marx, soldiers, coin-ops, and more. A previous show organized by USA Theatres was the Baltimore Non-Sports Card Convention, which featured numerous exhibitors from the non-sports hobby, including artists, authors, manufacturers, publishers, and dealers. 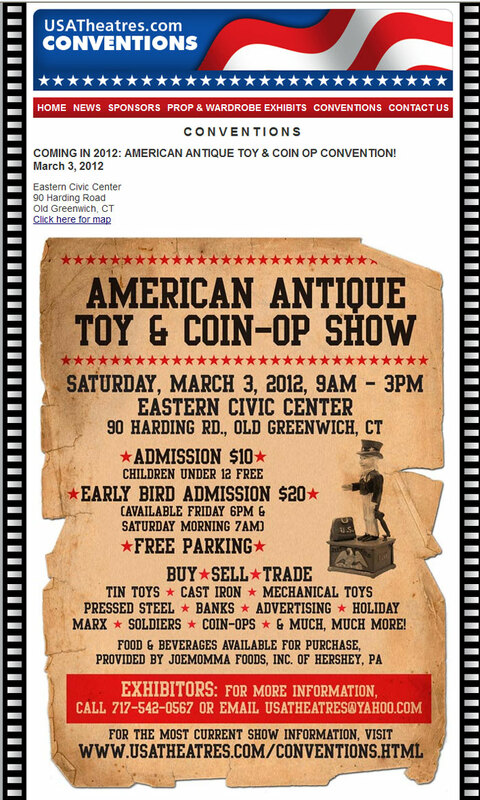 The American Antique Toy & Coin-Op Show is set to debut for the general public on Saturday, March 3, 2012, from 9:00 a.m. to 3:00 p.m. at the Eastern Civic Center, situated within walking distance from the Metro-North Train Station in Old Greenwich, Connecticut. General admission into the event is $10 for adults and free for children under 12. Early buyers are welcome Friday evening at 6:00 p.m. and also Saturday morning at 7:00 a.m. for $20 per person each day. A variety of food and beverages will be available for purchase at the show, provided by Joemomma Foods Incorporated of Hershey, Pennsylvania, according to the show’s promoter, USA Theatres. “It’s going to be a brisk and fantastic show,” Vastola said. 8 ft. by 8 ft. exhibitor spaces are currently available for $150 each and include one 8 ft. table, two chairs, and two exhibitor badges; while 16 ft. by 8 ft. spaces are available for $250 each, and 24 ft. by 8 ft. spaces are available for $350 each. 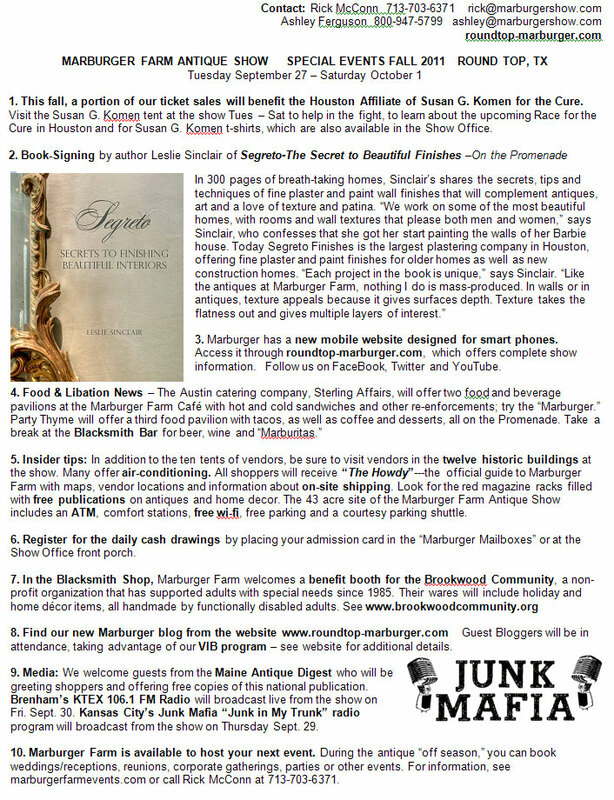 10.10.11 Round Top, TX— Marburger Farm has done it again. The twice yearly mega-show in Round Top, Texas has overcome hurricanes, wars, recessions and more. This Sept. 27–Oct. 1, the prospects included all of those, plus the tail end of the driest, hottest Texas summer in decades. But the not-so-little show that could pulled off a winner again. As the rain continued, someone turned up the volume on “Amazing Grace” and shoppers found that the 10 football field size tents and 12 historic buildings on Marburger’s 43 acre site provided perfect cover for shopping over 350 exhibitors from 38 states and several nations. Kenny sold gilded frames, a pair of nine-foot tall glass doors from an 1890 Pennsylvania building and a three foot wide mirrored ballroom ceiling disc from a 1920s Catskill resort. Like many antiques sold at Marburger Farm, that piece will travel further west to a Seattle shop. West coast wholesale buyers dominated the opening days. ”In spite of the heat early on, the designers and store buyers were here,” said Julie Harris of Kansas City, MO. “The first two days were strong selling days for me.” Harris sold, antique trunks and silver sporting trophies, many of them going west. Most exhibitors reported good to utterly outstanding sales, with many setting career records. “Our closing day on Saturday, was the highest we’ve ever had,” said Rhonda Holden of 2 Girl’s Stuff from Dallas. Holden sold six rugs, Spanish Colonial iron and antique bottles topped with industrial gauges for use as bookends and sculpture. The show also made a difference by hosting a benefit booth for the Houston affiliate of Susan G. Komen for the Cure, as well as for the Brookwood Community, a Texas non-profit group that empowers adults with special needs. Additionally, a portion of the show’s ticket proceeds benefited Susan G. Komen-Houston to help in the fight against breast cancer. In that spirit, the Marburger Farm Antique Show invites you, wherever you live, to the April 3-7, 2012 show, deep in the heart of Texas— where the bluebonnets are pretty darn resilient too. 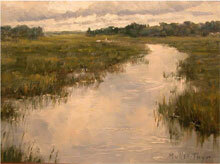 Kim Muller-Thym, 'Cloudy Creek,' oil, 9 x 12 in., estimate $1,200. Image courtesy of Salmagundi Club. NEW YORK – New York City’s revered Salmagundi Club – an artists’ organization founded in 1871 – is planning a major fundraiser during the month of October that comprises three auctions of juried artworks submitted by its artist-members. The auctions will be held at the Salmagundi Club on Friday, Oct. 14 at 8 p.m., Sunday, Oct. 23 at 2 p.m. (following a brunch in the dining room), and Friday Oct. 28 at 8 p.m. As a special incentive, no buyer’s premium will be payable on any artwork purchased, and to accommodate those who cannot attend in person, there will be Internet live bidding through LiveAuctioneers.com. 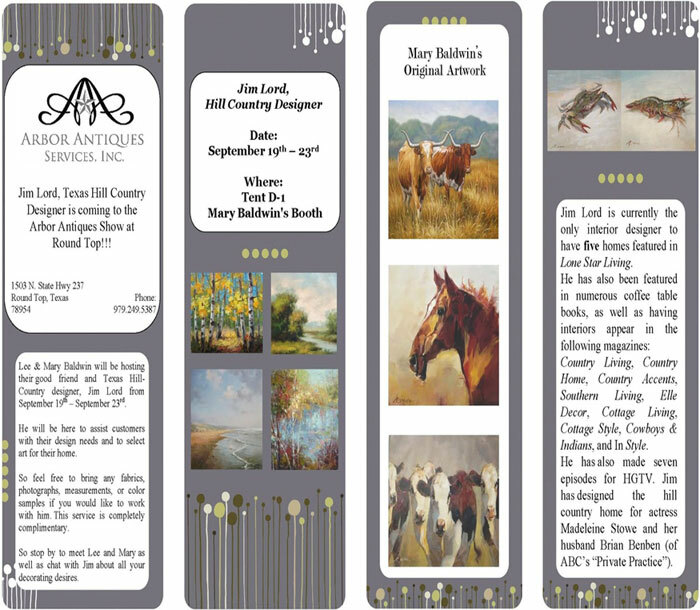 All painting media will be represented in the October auctions, including oils on canvas, acrylics on canvas, etchings, watercolors, sculptures, pastels under glass and lithographs, some of them hand colored. Additionally, there will be original drawings, pen-and-ink works and photographs. Most of the two-dimensional works are framed, while a few are gallery-wrapped with canvas. 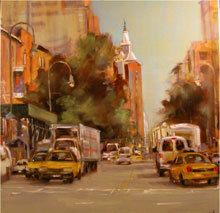 Anne Kullaf, 'Daydreams on 14th Street, oil, 20 x 20 in., estimate $1,500. Image courtesy of Salmagundi Club. upcoming auctions is quite exceptional. Our board is committed to maintaining a high level with our auctions, and that includes introducing bidders to the work of talented emerging artists, as well,” said Seymour. In the past, Salmagundi Club auctions have operated under a fixed, flat-rate structure whereby nearly all artworks opened at $300, sculptures at $300-$400, and photos or multiple impressions at $150. Seymour explained how the artworks are selected for inclusion in the auctions. “Each artist-member may submit up to three pieces for consideration. Our art committee juries the art and selects those pieces that we believe have both the highest artistic merit and the greatest likelihood of selling. If three artworks from a particular artist are chosen, each will go into a different sale so they aren’t competing against each other,” Seymour said. 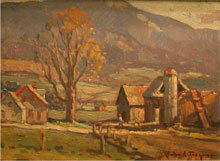 John Traynor, 'Jeffersonville, Vermont,' oil, 9 x 12 in. Image courtesy of Salmagundi Club. Proceeds from the auctioned artworks are divided evenly between the artists and the club. “Normally, if an artist sells a work through one of our exhibitions, they receive 70% and the club receives 30%, but because the fall auction series is our principal fundraiser, our artist-members have graciously agreed to a 50/50 split,” Seymour said. Beginning on Monday, Oct. 3, all artworks entered in the fall auction series will be displayed in a public exhibition at the Salmagundi Club. On Thursday, Oct. 6, the club will host a reception from 6-8 p.m. that includes the presentation of awards to the exhibition’s prizewinners. Exhibition hours are Monday through Friday from 1-6 p.m., and weekends from 1-5 p.m. Auction dates and times are Friday, Oct. 14 commencing at 8 p.m.; Sunday, Oct. 23 at 2 p.m. (following a brunch from 11 a.m. till 3 p.m. in the club’s dining room); and Friday Oct. 28 starting at 8 p.m. All events, including the brunch and reception, are open to the public. The Salmagundi Club is located at 47 Fifth Avenue between 11th and 12th Streets in Manhattan. For additional information about the auction, call 212-255-7740 or e-mail info@salmagundi.org. Visit the club’s website at www.salmagundi.org. Online catalogs for the three October auctions may be viewed online at www.LiveAuctioneers.com, where prospective bidders may also sign up to bid absentee or live via the Internet. Absentee bidding will also be available via written bidding forms at the preview. Steeped in history, the Salmagundi Club is one of the oldest art associations in the United States. Since 1917, it has been headquartered in what is now the only remaining brownstone on Fifth Avenue, directly across from the First Presbyterian Church. Its roster of past members includes such fine-art luminaries as Thomas Moran, William Merritt Chase, Louis Comfort Tiffany, N.C. Wyeth and Childe Hassam. Of its 850 currently active members, more than 600 are artists. The club’s activities include art classes, exhibitions, painting demonstrations and both fundraising and social events. The nonprofit Salmagundi Club owns a collection of more than 1,500 works of art spanning its 140-year history. 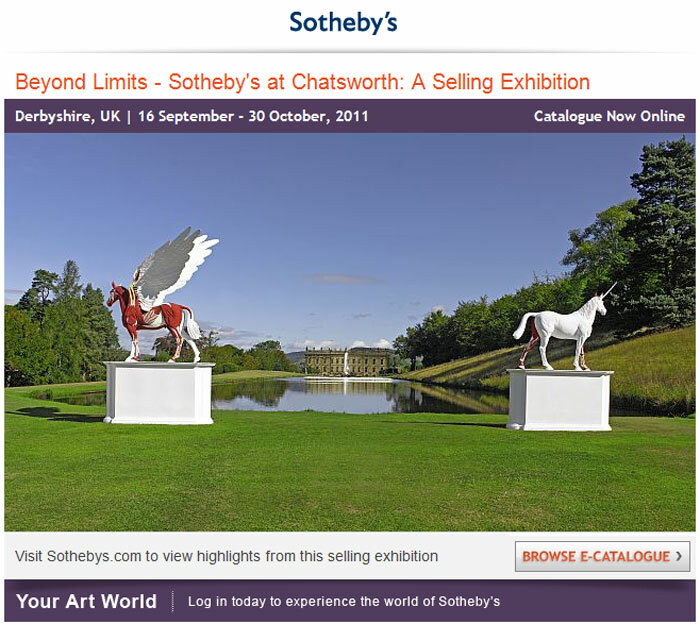 Sotheby’s annual selling exhibition of monumental sculpture returns to Chatsworth for its sixth installment this autumn, with an extraordinary line up of artists, many of whom have never been shown at this magnificent location in the Peak District before. It runs from September 16th to October 30th. 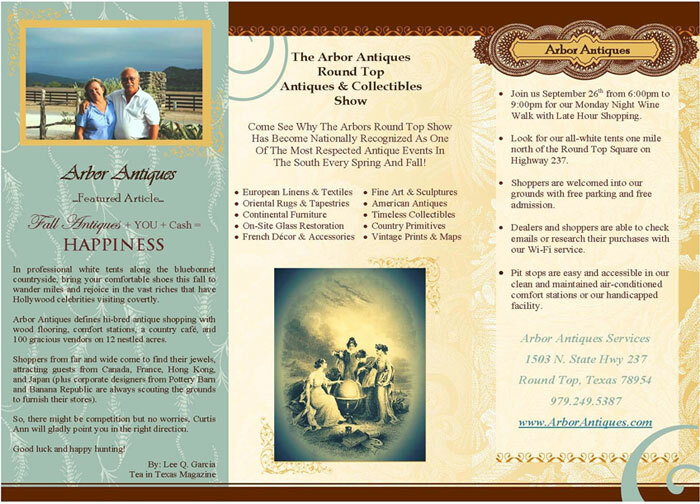 Arbor Antiques Services promotes a Spring and Fall Round Top Show every year during the nationally known Antiques Festival in Round Top, Texas. Our Round Top show site is located on eight acres at the American Legion Post #338 on Hwy. 237 off of Hwy. 290. We are just 2 miles from downtown Round Top. We offer dealer spaces in an air-conditioned hall and in several large big top tents. We have free admission, free parking and an on-site cafe. As an antique dealer or a shopper, you will not want to miss this antiquing experience in Round Top, Texas.